It took me six batches to get there, but I did! And I am ridiculously thrilled about it! All thanks to one little ingredient that gave me that requisite airiness: agar agar powder. What is agar agar? It is an odorless, colorless, tasteless gelling agent derived from seaweed and a perfect vegan substitute for animal gelatin. I like to use agar in the powdered form because it is the easiest. You can get agar agar powder at Japanese or Indian grocery stores, health food stores or online. There are many brands available. With my tips below, it is as easy to use as powdered gelatin. AGAR VS. GELATIN. Agar agar sets a teeny bit more firm compared to gelatin, but for all practical purposes, agar and gelatin can be used interchangeably in pretty much equal amounts in recipes, including this one (just make note of my two agar tips below). Similar to gelatin powder, agar powder also needs to first bloom in liquid to hydrate - this just means sprinkling it into a liquid and waiting 5 minutes. You can substitute gelatin powder in approximately the same amount as the agar powder (your mousse will still be dairy-free but obviously no longer vegan). See my recipe NOTES below for the how-to. TWO CRUCIAL TIPS FOR USING AGAR. The two things to know for using agar powder successfully (besides hydrating it like I mentioned) is (1) boil it for 5 minutes to activate its gelling properties and (2) make sure it is completely dissolved otherwise the outcome will be grainy, not silky smooth, mousse. I had one grainy batch because the agar didn’t dissolve fully but DO NOT worry, I changed the step in the recipe to make it fool-proof. The agar powder is first dissolved in water (rather than in the opaque coconut cream) so we can know with certainty when the powder has fully dissolved. Your mousse will be silky smooth. CAN I OMIT THE AGAR POWDER? In my initial batches without any agar powder, I got that rich and luxurious chocolate taste I desired, but no matter how much I whipped it or tweaked the chocolate-to-liquid ratio, I couldn’t get any lift into it. No lift, no airy mousse. If you enjoy a little lightness in your mousse, you definitely should not skip the agar powder. I personally dislike super duper light mousses but I do feel strongly that the tiny amount of agar powder in this recipe gives the mousse the quintessential fluffiness that makes it a mousse in my mind. Otherwise it’s kinda just…pudding. Guys, this dreamy mousse texture is just perfect! Coconut Whipped Cream is finicky. When you read the recipe below, you will see that it lists coconut cream as an ingredient. But not coconut whipped cream which is commonly used in vegan mousses, “whipped” being the operative word. If you are dairy-free, you are probably familiar with the procedure for creating coconut whipped cream which requires chilling cans of coconut milk for 2-3 days to allow the creamiest portion to rise to the top so it can then be scooped out (leaving behind the watery portion) and whipped into cream. My experience with whipping coconut cream has been hit and miss. It is finicky business, largely depending on the brand of coconut milk you use (including whether emulsifiers are used), how well it separates and who knows what the heck else. (Not me). If you think you can skip all that and buy canned coconut “cream” and whip that, think again because sorry, it can still be too watery. It’s possible to strain the coconut cream in cheesecloth to rid excess water, before or after whipping. I’m exhausted already. I willingly go through this process when there is no proper substitute for dairy-free whipped cream (i.e. for dolloping a pie, filling a Paris Brest or topping a pavlova) but I was SO happy to find another way for this chocolate mousse! Confession time. Even though I eschewed aquafaba in the chocolate mousse itself, I did turn to it for the vegan peppermint meringue kisses in this post. It is the absolute best way to make egg-free meringues, especially little meringues like these kisses (full-sized pavlovas haven’t worked as well for me) and they legitimately taste just like egg-white meringues. I know not of another fool-proof way so I was good with the use of aquafaba there. 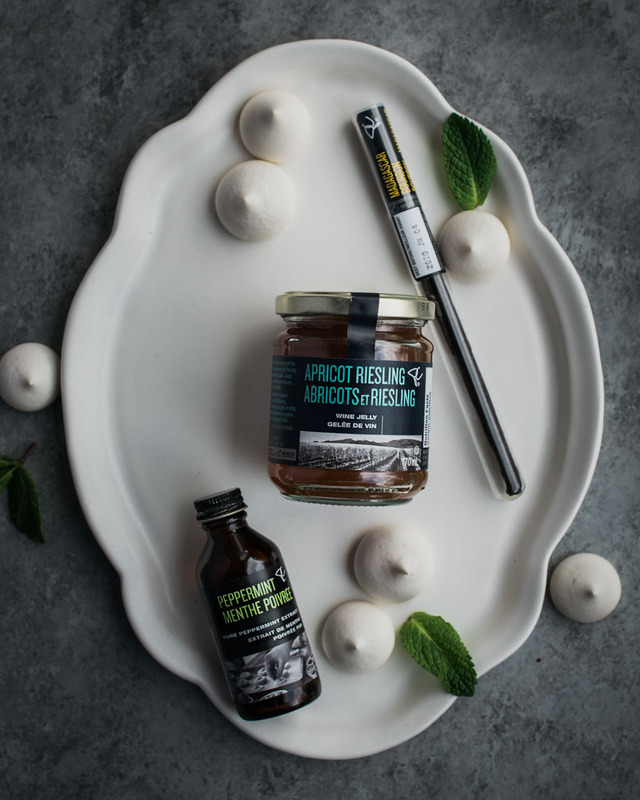 If you are not cool about chickpea brine in dessert, you can make traditional egg-white meringues (obviously no longer vegan) or skip the meringue altogether and add more crushed candy cane or even shaved chocolate. Contents of the PC Black Label Black Box + $50 Giftcard in this month’s GIVEAWAY! This month I am giving away one PC Black Label Black Box to a Canadian reader. It will contain the same three products I received, plus a CDN$50 President’s Choice gift card to purchase groceries! How necessary is that as we enter the holiday entertaining season. 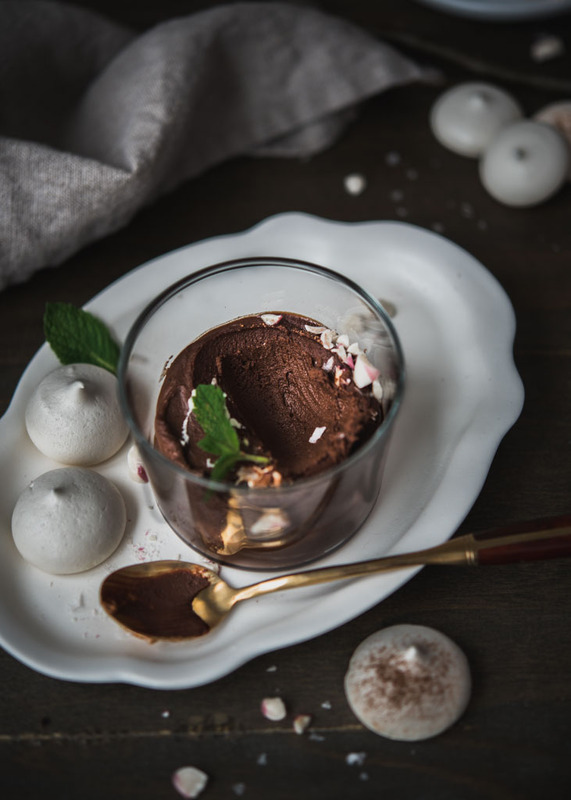 Apart from the peppermint extract and vanilla beans used in this chocolate mousse recipe, the box will also contain a PC Black Label Apricot Riesling Wine Jelly which will be perfect for completing your holiday party graze boards. To enter and read the details of the Canadian giveaway, head over to my Instagram feed tonight when this chocolate mousse is posted! Giveaway closes 12AM EST Midnight Thursday, November 29th and the winner be contacted via direct message on Instagram by 5PM EST Friday, November 30th. I simply can not wait to give away one of these boxes so you can have the fun I have and #PlayWithYourFood in your holiday baking and cooking too! 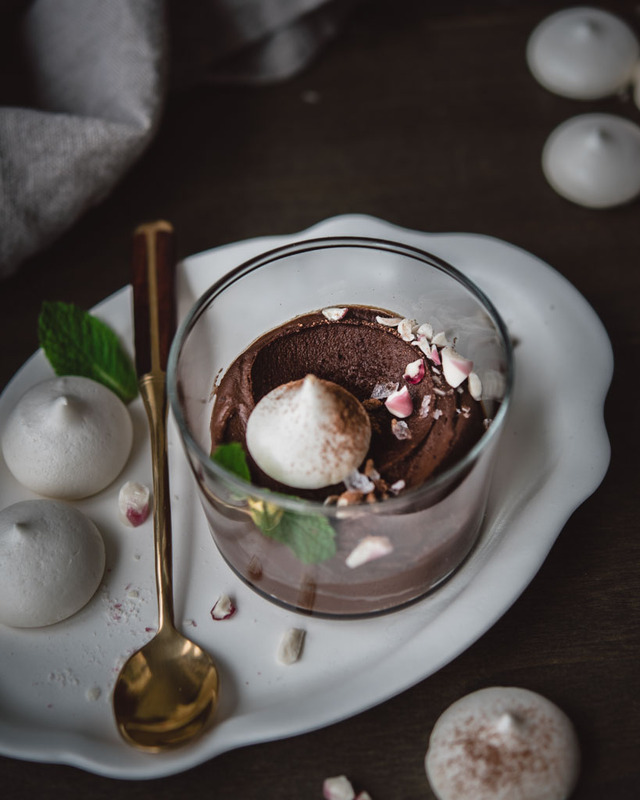 MAKE IN ADVANCE: Although this recipe can all be made the day-of, I prefer to make to prepare everything the day before to (1) allow the chocolate mousse to chill overnight and (2) dry out the meringue kisses in the oven overnight. Then it’s as easy as pulling it out of the fridge and garnishing with meringue, crushed candy canes and cacao powder to serve. AGAR AGAR POWDER: Agar powder needs to boil for 5 minutes for its gelling properties to function. Agar powder must be fully dissolved or it will result in a grainy mousse. SUBSTITUTING WITH GELATIN POWDER: You can substitute gelatin powder in approximately the same amount as the agar powder (your mousse will still be dairy-free but obviously no longer vegan). To use gelatin powder, follow the same direction for agar and sprinkle 1/4 tsp of gelatin powder into the water and allow it to hydrate for 5 minutes EXCEPT do NOT boil. Add the coconut cream, maple syrup, vanilla bean seeds and peppermint extract and bring to a scalding hot temperature, without boiling. Pour onto chocolate to melt and continue with same steps. COCONUT CREAM VS. MILK: This recipe uses coconut cream, not coconut milk, which has a higher content of fatty creaminess. I tested this recipe with Savoy Coconut Cream, Nature’s Charm Coconut Cream and Cha’s Organic Coconut Cream. If you use coconut milk, the resulting mousse will naturally looser and less creamy. SCALD BUT DO NOT BOIL THE COCONUT CREAM: Do not boil the coconut cream to avoid curdling. Curdling the coconut cream would negatively affect the silky smoothness of the mousse. Peppermint Chocolate Mousse recipe makes about 3 Cups which can serve 6-8 people depending on desired portion size. Peppermint Meringue Kisses recipe makes ~35 kisses. Extra meringue kisses can be stored in an airtight container for 2-3 days depending on humidity, after which they will begin to soften (but are still yummy). Place the water in a small saucepan and sprinkle in the agar agar powder. Allow it to hydrate for 5 minutes. Meanwhile, place chocolate chips or chopped chocolate in a heat-proof dish large enough so that the chocolate pieces are nicely spread out more or less in a double layer. You'll want them to have good contact with the scalded milk in a following step to get melted properly. After 5 minutes hydrating the agar, bring the water and agar mixture to a boil over medium heat and continue simmering for 5 minutes, stirring constantly with a spatula, or until the agar powder is fully dissolved into a clear liquid i.e. you can no longer see opaque pieces of agar. This step is important to avoid a grainy mousse. Watch it closely and lower the heat if needed to maintain a boil but not so vigorous a boil that it evaporates all the water! Once the agar agar is fully dissolved (no more visible pieces in the water), add the coconut cream, maple syrup, vanilla bean seeds (or extract) and the peppermint extract. Whisk to combine well. Gently bring the coconut cream mixture to a scalding temperature (tiny bubbles on the sides and wisps of steam coming off the surface) but not boiling. You need the liquid to be hot enough to melt the chocolate in the next step, but do NOT boil the coconut cream or it may curdle and affect the smoothness of your mousse. Once the coconut cream is scalding, pour it evenly over the chocolate chips and allow it to sit for 5 minutes for the heat to melt the chocolate. After 5 minutes, stir with a spatula until well combined into a smooth chocolate ganache. Scoop the chocolate into the bowl you will be using later to whip it (i.e. a stand mixer bowl) and chill the mixture until it is set or no longer liquidy, about 1.5-2 hours. Once set, whip it using a stand mixer fitted with the whisk attachment, starting at low speed for the first 5 seconds until the hardened chocolate begins to break up and increasing to high speed for 2 minutes, until smooth and fluffy. At this point, the mousse is silky and smooth but does not have the moussy airiness yet as the agar has not fully set with the air you just incorporated via whisking. 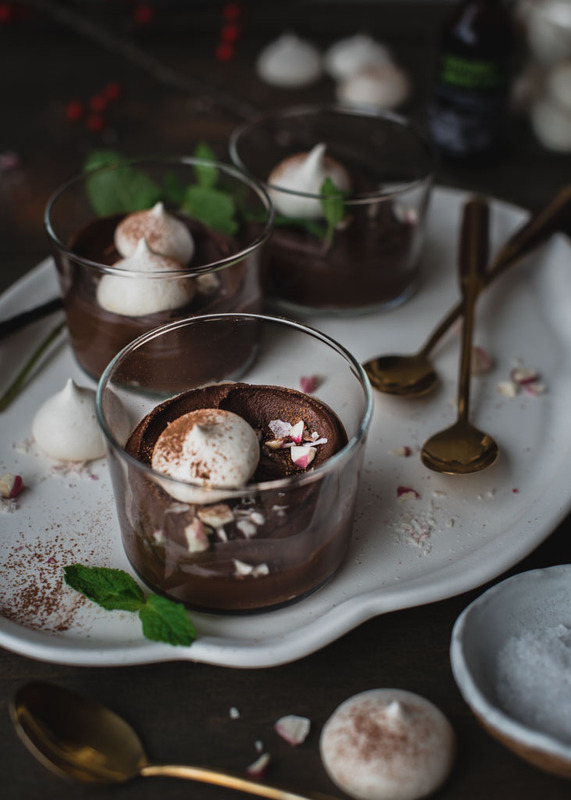 Pipe or spoon the mousse into serving dishes (hold off on the peppermint meringue and candy cane garnish for now). You may serve it right away if you like the creamy and pudding-like version of mousse. It's totally divine already. Or, I highly recommend if you desire a bit of fluffiness in your mousse as I do, allow the agar powder to set further by chilling the mousse again for several hours or preferably overnight. I chilled it overnight and found the texture perfect: luxuriously smooth but with airiness (air bubbles) when I run a spoon through it. Preheat oven to 200f. Line one large baking sheet (or two regular sized baking sheets) with parchment paper. Drain and reserve the aquafaba/brine from the can of chickpeas. The aquafaba should be at room temperature. 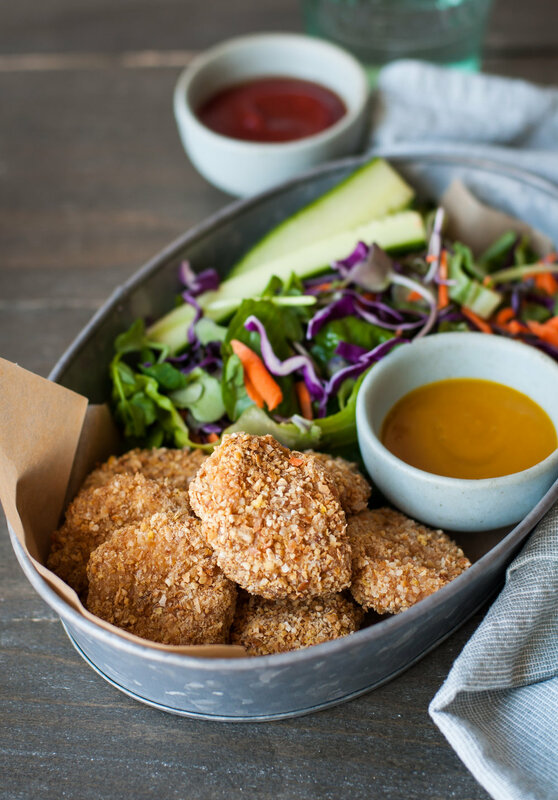 Keep the chickpeas for something else. Place the aquafaba into the bowl of a stand mixer fitted with the whisk attachment, along with the cream of tartar. Start whisking on low to avoid splashes and increase speed to medium-high. Continue whipping until it soft peaks forms. Gradually, with one tablespoon at a time, add the icing sugar while whipping, stopping to scrape down the side of the bowl once or twice. Continue whipping until the you have firm glossy peaks, which for me took about 5 minutes (tip: to confirm if meringue is ready, invert the bowl upside down and the meringue should not move). Gently fold in the vanilla and peppermint extracts, taking care not to deflate the air in the meringue. Snip off the tip of a piping bag about 1/2" in diameter. Scoop the meringue into the piping bag (you may need to do two batches) and pipe kisses onto the parchment, leaving about 1" spacing between them. Bake for 2 hours or until meringues are dry (you can try one to confirm the inside is not still wet). Leave them in the turned-off oven to dry further for at least 1 hour or up to overnight if more convenient. Just before serving, garnish with 2 or 3 meringue kisses, a dusting of cacao powder and sprinkle of crushed peppermint candy cane. Enjoy licking your spoon and bowl clean! This post was sponsored by Presidents Choice PC Black Label but all opinions are my own. Thank you for supporting the brands that enable me to create new content for this site!